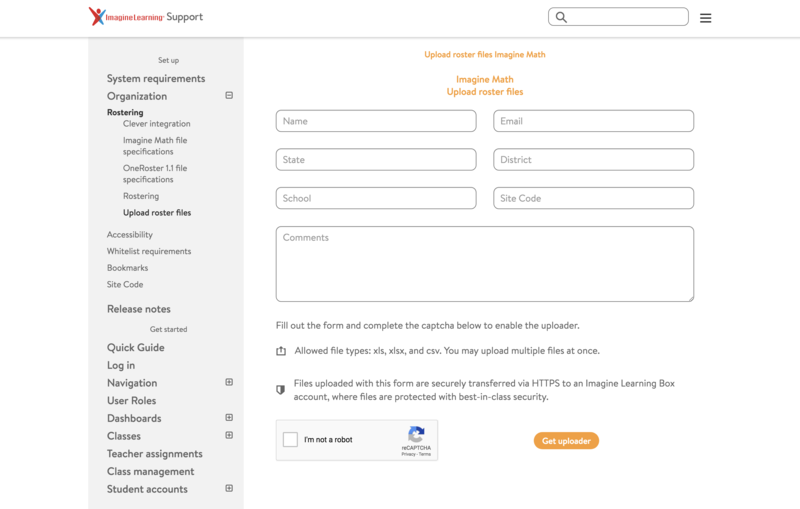 If you are new to Imagine Math, you'll need to create student accounts. The method you use depends on how many students you need to add. When you are adding fewer than 50 students, you can easily create students individually in Imagine Math. You'll be walked through the steps as you go. Log in to Imagine Math. Click Import in the blue Quick Start box. Click Get Started under Go Step-by-Step. Click Add a Classroom. We recommend using the teacher last name and period number. When you're finished entering the information, click Create Classroom. Select the classroom where you want to add students. Enter the student information, then click Finish Adding Students. Student accounts can be created by uploading spreadsheets directly to Imagine Math. You will be walked through the steps as you go. Click Get Started under Upload a CSV. Use the dropdown menu to select a school and Add Teachers and Classrooms, then click Next. Click Download Template and Upload File Details and Instructions. Fill in the template. Click Select File to upload and click Next. Review the actions and any errors in the upload. When satisfied with the results, confirm changes and click Next, then click Start New Import. Select Add Students and Classrooms from the dropdown menu, then click Next. Download the template and fill in necessary information. Click Select File to upload the template. Confirm changes and click Next. You will receive a Complete message. Files uploaded with more than 200 rows may not appear to be submitted. To complete these larger imports, please contact rostering@imaginelearning.com or reprocess the import using smaller files. You have at least 3 schools that you need to onboard. You're already extracting multiple files from your SIS and providing them to 3rd party application providers or SIS integration services. You're comfortable manipulating rows and columns on comma separated value (CSV) files to accurately represent data relationships. Download the import templates and prepare your files. See Imagine Math file specifications or OneRoster™ 1.1 for detailed information about populating the templates. The Imagine Learning Data Integration team assists you with the rostering process. Imagine Math can integrate with ClassLink or Clever to load and sync roster data. The Imagine Learning Data Integration team is available to assist with answers to your questions.